A shortfall in the personal income tax collection resulted in the union government closing the financial year with the direct tax mop-up at Rs 11.38 lakh crore as compared to the target of Rs 12 lakh crore for 2018-19. The direct tax includes personal income tax and corporation tax. While the corporate tax collection stood at Rs 6.71 lakh crore, personal income tax took a beating last year. The I-T department collected Rs 4.67 lakh crore against the target of Rs 5.29 lakh crore in personal income tax. This included Rs 11,000 crore on account of securities transaction tax. “The entire shortfall of Rs 62,000 crore is on account of personal income tax. It is harder to get people to pay taxes than to make them file returns,” said a senior official in the finance ministry. The direct tax collection showed a growth of 13.6% over last year as against the target of 20.1% for 2018-19. In the Interim Budget, the direct tax collection target for the past year was revised at Rs 12 lakh crore, up from the budget estimate of Rs 11.5 lakh crore which represented a growth target of 15%. The higher revised target was seen as unrealistic by many in the government. As many as 6.78 crore tax returns were filed during the last year. However, the number of people who filed returns were only 5.43 crore. This is mainly due to many taxpayers filing their returns twice, mostly to make corrections. According to the government, the taxpayers’ base has gone up exponentially in the past four years with the number of return filers almost doubling in a short time. “This has, however, not resulted in higher tax collections in similar proportion,” pointed out the official. A taxpayer is a person who has either filed I-T return or in whose favour tax has been deducted at source. The number of people under the taxable category is expected to further decrease as anyone earning up to Rs 5 lakh will not have to pay income tax during the current financial year 2019-20. The income-tax threshold limit was increased to Rs 5 lakh per annum in the Interim Budget. In fact, individuals with annual gross income up to Rs 7-8 lakh are likely to avail the benefit if they make investments under the instruments such as Public Provident Fund (PPF) as well as pay home loan. This would lead to over 3 crore people getting tax exemption. The impact on the exchequer is likely to be around Rs 22,000 crore or more. The Interim Budget 2019-20 has estimated to collect Rs 13.80 lakh crore from direct taxes, representing a growth of 15%. With lower direct tax revenue growth seen in 2018-19, the growth target of 15% for the current year will also have to be revised upwards to maintain the tax collection target. Ahmed Patel castigates PM Modi on BJP’s Sankalp Patra. Says it’s a pack of lies to deciet countrymen. Services of Vodafone remained affected in Mumbai for the second consecutive day on Friday, wherein many of its customers posted their grievances on the social media platforms. Many customers, on Thursday, took to social media and complained about the network outage that was took place in Borivali, Mira Road, Bhayander, Bandra etc. Further, when it comes to telecom sector, majority of the telecom users are of three companies majorly including Vodafone, Airtel and Reliance Jio. Another trouble in telecom that users face is that of call drops. Meanwhile, DNA had earlier reported as to how out of the total complaints received by Telecom Regulatory Authority of India (TRAI) against call drops between January 1, 2018, and December 5, 2018, Delhi had the highest number of complaints against call drops followed by Mumbai having second highest in the country. Out of 1,073 complaints, around 35 per cent of complaints were from Mumbai and Delhi. According to the data, a total of 163 complaints of call drops were received by TRAI from Mumbai followed by total 220 complaints from Delhi. What is a brand? The term ‘brand’ originates from branding or identifying mark used for livestock. Today, it has become a very important, integral part of the corporate world and is associated strongly with it. Millions of dollars are spent every year to reinforce the brand and increase its recall value. Cut-throat competition has only increased this phenomenon. Whether it is global brands such as Google, Apple, Nike or well-known Indian ones such as Tata or Amul, each has its own unique story to tell and sell. Brands are known through their logo, identity, colours, spaces and a whole range of experiences. But they are much more than a set of tangible experiences. Ultimately, brands are about a philosophy or a value system. Corporates often pay much more attention to tangible manifestations of brands without introspecting enough about their philosophy, which is detrimental in the long term. They diversify into different verticals and there is no common brand identity which holds them together. Only brands with strong philosophies and value systems are able to unite multiple products, services coherently and create a deep impact. Much has been already written about brand Gandhi. What made brand Gandhi was not the tangible manifestations but a unique philosophy which touched millions of lives, which outlived the freedom struggle and which continues to organically influence people to be a part of it. A prominent Gandhian Padmashri Haku Shah, or Hakubhai as he was popularly known, passed away recently. He was an internationally acclaimed artist deeply influenced by the rich folk tradition of India, a cultural anthropologist and researcher who went for meticulous field studies and did in-depth analysis and documentation of crafts, an academic who greatly influenced a generation of students at National Institute of Design with his work, a curator who set up a unique tribal museum in Gujarat Vidyapith, Ahmedabad, a designer who came up with the pioneering idea of a craft village in Udaipur and an activist who sought to improve the lives of artisans. He was also an author-illustrator of many books including children’s literature. Incidentally, his last book was called Manush, or human being. How was he able to wear so many hats? How could he bring forth a unique, unconventional approach in all that he did? The guiding force for all that he did was his Gandhian philosophy and a child-like optimistic belief in humanity. The story of a brand is about being true to the philosophy and value system at the core and the ability to constantly create meaning and impact for others. This works at multiple levels, whether it is the brand identity of individuals, institutions, organisations or the corporate world. A day after Jet Airways deferred the March salaries of its employees, the airline’s management, lenders and government officials took stock of the situation on Thursday, holding series of meetings in the national capital. Earlier during the day, the consortium of lenders led by State Bank of India (SBI) met the civil aviation secretary, updating him on the plans of action. During the afternoon, the lenders met Jet Airways CEO Vinay Dube to discuss the mode and period of funds infusion, which is likely to be made in trenches, the sources said. The lenders added that EoIs will be invited on April 6 and will need to be submitted by April 9. They also said that they are cognizant that the outcome of the efforts will depend on the interest shown by the parties in the sale of stake in the company. “Whilst all efforts will be made for the stake sale by the lenders, other options may be considered by the lenders should these efforts not result in an acceptable outcome” the statement continued. On March 25, Jet Airways’s Board had approved a resolution plan formulated by SBI-led domestic lenders, under which they had agreed to infuse an emergency funding of Rs 1,500 crore into the airline, and convert the same into equity worth 50.1% for a notional value of just Rs 1 each share. However, the funds are yet to be disbursed as legal formalities are being worked out. Civil aviation secretary Pradeep Singh Kharola said in a media interaction in Delhi on Thursday the ministry will see what is to be done of international flying if the number of Jet Airways aircraft in operations fall below 20. An airline is allowed to fly internationally only if it has at least 20 aircraft under its fleet. Jet is currently flying 26 aircraft. Meanwhile, Jet Airways faced more headwinds on Thursday. There were reports that oil companies had stopped supplying jet fuel to the airline at Delhi airport and it was resumed only after the airline’s management assured them of the payments. Further, Avolon, one of the world’s biggest aircraft lessors, has applied with aviation regulator Directorate General of Civil Aviation for de-registration of two of its aircraft currently under the possession of Jet Airways. Sources said the earlier groundings of planes by Jet Airways have been on consensual terms. IL&FS Financial Services Ltd (IFIN) has a gross non-performing assets (GNPA) of around 90%, possibly a record for companies in its financial bracket. “One of the things that would have struck many of you is that a company which reported GNPA of about 5% in March 2018 (has such a high GNPA later). I have heard double digit GNPA, but 90% GNPA, I am sure all of you would say is unusual by any standards that is the challenge which we have to face,” said Uday Kotak, non-executive chairman, IL&FS, on Wednesday. Six months ago, on October 3, Uday Kotak-led management took charge of IL&FS group. IFIN has an external exposure of Rs 10,656 crore, while the exposure to IL&FS Group and its various entities is Rs 6,849 crore. IFIN’s other current assets is Rs 1,300 crore, making the total exposure Rs 18,805 crore. As of March 2018, the gross bad loans were around 5.3%, which jumped to around 61.8% in September 2018. This further increased to about 90% in December 2018. “As far as enforcement with the third parties is concerned, the recovery process is on. But I still fear that we are staring at around 90% gross NPA, which means that these are difficult credits. We have lent money, but they have defaulted on their normal servicing. There’s a portion of the credit, which we have been able to collect Rs 697 crore from those assets. We have also been able to get Rs 235 crore from the recovery process,” said Sivaraman. Showing confidence in improving the numbers, the senior executive said they are not saying that this 90% is to be forgotten. “The recovery efforts are on. There are enough opportunities to make sure that we are able to recover. We will use the legal process to recover in the form of Insolvency and Bankruptcy Code (IBC), one-time settlement, even criminal process, etc; multiple ways of making the client or borrower to come to the table. We can’t predict the timeline over here. It’s going to be time consuming and long drawn process,” Sivaraman said. At the group level, the total outstanding debt (fund based as well as non-fund based) currently stands at Rs 99,354 crore. Of this, Rs 48,470 crore is fund-based debt in four holding companies, namely, IL&FS, IFIN, IL&FS Energy Development Co Ltd (IEDCL) and IL&FS Transportation Networks Ltd (ITNL). Kotak also expressed concern about the net worth of the entities and businesses of the group. “It would be reasonable to assume that there is significant erosion in net worth, and in many cases there could be significantly negative net worth,” he said. Reflecting a loss of “growth momentum”, manufacturing activities in the country slowed down to a six-month low in March amid softer increases in new orders, production and employment, according to a survey. The Nikkei India Manufacturing Purchasing Managers’ Index (PMI) declined to 52.6 in March from 54.3 in February, a report said Tuesday.A reading above 50 indicates expansion while a print below that level points to contraction. “Falling from 54.3 in February to a six-month low, the latest figure highlighted a loss of growth momentum,” the report said, adding that although operating conditions in the Indian manufacturing industry continued to improve, there was a widespread slowdown in growth. As per the report, factory orders and production expanded at the slowest pace since last September while job creation eased to an eight-month low in March.”Softer increases were registered for new orders, production, input buying and employment. The deceleration was accompanied by subdued inflationary pressures, with rates of increase in input costs and output charges below their respective long-run averages,” it noted.However, business sentiment strengthened to a seven-month high. Pollyanna De Lima, Principal Economist at IHS Markit and the author of the report on the PMI, said manufacturing sector expansion in India took a step back in March, with metrics for factory orders, production, exports, input buying and employment all moving lower. “Still, growth was sustained on all fronts. Although global headwinds and a general slowdown in trade present some concerns for the future health of Indian manufacturers’ order books, so far companies have been able to weather the storm and secure healthy inflows of new work from abroad,” De Lima noted. The index is based on data compiled from monthly replies to questionnaires sent to purchasing executives in more than 400 industrial companies. The latest data also comes ahead of the Reserve Bank of India’s first monetary policy for the current financial year which is to be announced on April 4 and there are expectations of a rate cut. Taxmen in 22 countries worldwide have raked in more than USD 1.2 billion in fines and back taxes thanks to the 2016 “Panama Papers” leak of information about offshore dealings, media reported Wednesday. German newspaper Sueddeutsche Zeitung — which received the massive leak of documents from Panamanian law firm Mossack Fonseca on which the investigation was based — reported Berlin has reaped USD 183 million from related tax probes. “While recouping the proceeds of hidden assets helps to fund vital government services, there is a growing sentiment that the enduring legacy of the Panama Papers will be its effect on behaviour and public attitudes,” the ICIJ said. Tax authorities have scrambled to respond to the massive tax evasion system that the leak revealed was organised through Mossack Fonseca’s Panama City offices. In a major relief for corporate major Larsen and Toubro (L&T), the Gujarat High Court has saved it from customs duty demand of Rs 330 crore and an interest of Rs 202 crore for allegedly violating provisions of the Customs Act with regard to storage and release of imported goods from a private bonded warehouse in Hazira. The company is involved in the manufacturing of oil exploration platforms and related machinery, and ship building, at its Hazira facility. The demand notice for the period 1986-2012 was issued by customs department on the ground that the goods imported and stored in the private bonded warehouse were used for manufacturing in the warehouse and cleared from there after the stipulated expiry of one-year. The department claimed that the company never applied for extension of warehousing period and treated the same as ‘improperly removed goods’. It also claimed that some of the imported consignments were stored in the warehouse, used for manufacturing, and cleared from there after expiry of 90 days and before one-year, on which interest is recoverable as per the Act. A division bench of the court quashed and set-aside the demand notice by remarking it as “illegal”, “belated”, “without authority and law” and “unreasonable”. The court held that throughout the disputed period, there were sufficient checks and balances, where the officers of the department were in control and monitored the movement of goods at the warehouse. The court also held that once the goods were released in the manufacturing process, merely because the same private bonded warehouse was also the manufacturing site, the same cannot be termed as warehoused goods having been stored beyond the stipulated period. The court also held that when warehouse was also the manufacturing site, the restriction of removal from the warehouse within the stipulated period is immaterial. It also considered the fact that production cycle in ship manufacturing is a relatively long process. During the hearing of the matter, the counsel for the company contended that the union government had issued various notifications since 1986, with the latest being on March 17, 2012, exempting the raw materials and parts used for manufacturing of goods supplied in connection with offshore oil exploration and ships from customs duty. The company also argued that there had been several CAG audits of its warehousing and manufacturing operations since 1986, but the company was never informed about the improper removal of goods, except for the arbitrary demand notice. The company also argued that the imported goods were immediately issued for further manufacturing on the basis of approved ‘issue slip’. Therefore, they do not remain as warehoused goods and hence, cannot attract interest liability. It was also submitted that the authorities cannot raise a demand after 28 years, especially considering the fact that the warehousing and manufacturing facility of the company was under the physical control of the department. On the contrary, the customs department contended that the demand notice was as per law and the court does not need to interfere in it. It also contended that the company is supposed to pay interest on the imported goods which remained in the warehouse beyond a period of 90 days. It was also submitted that provisions of the Customs Act make it amply clear that when imported goods have not been removed from a warehouse within one-year, such goods are to be treated as improperly removed goods. However, its submissions failed to convince the court. 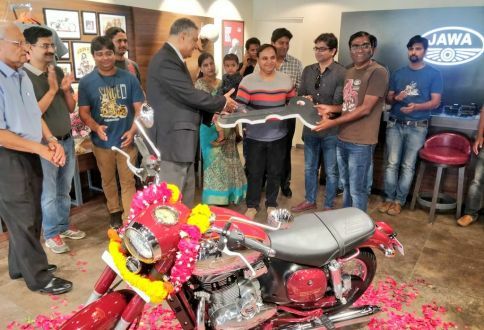 It was a momentous occasion for Classic Legends, which relaunched the iconic Jawabrand in our markets, as the first Jawa bike was delivered yesterday. The first lot of Jawa bikes will be delivered to customers based on the online booking sequence (starting from November 15). At the time of launch last year, Jawa had announced that the first lot of bikes will be handed over to customers in March and the brand kept its word. Classic Legends also held a special auction for 13 chassis numbers, proceeds of which will be handed over to the Indian Armed forces. The winning bid was a whopping Rs 45 lakh for chassis no.1 and in total, the brand managed to rake in Rs 1.43 crore. Jawa has two bikes on sale in the Indian market – Jawa & the Jawa Forty Two. The base Jawa Forty Two retails for Rs 1.55 lakh, while the dual-channel ABS model has been priced at Rs 1.64 lakh. The Jawa carries a sticker price of Rs 1.64 lakh while the dual-channel ABS model retails for Rs 1.73 lakh (all prices are ex-showroom, Delhi). Jawa currently has 95 dealerships across India. India has a huge potential and the real question is the speed of growth and how many roadblocks it is willing to remove, former PepsiCo chairperson Indra Nooyi has said.Nooyi, in October last year, stepped down as the CEO of the global beverage giant, after 24 years with the company, the last 12 as its CEO. “The country does have huge potential, talent wise, population, everything, the country has huge potential. The real question is the speed of growth and how many roadblocks are we willing to remove,” Nooyi said responding to a question on India and its growth potential during an interaction hosted by the Consulate General of India in the city on Thursday. “India has got to do what is right for India. I am not the person to opine on that. India has got to do what is right for India, just as Europe should do what is right for Europe,” she said. Nooyi was the guest speaker at the ‘New India Lecture’ series, organised by the Consulate under the aegis of Consul General Sandeep Chakravorty and in partnership with the US-India Strategic Partnership Forum (USISPF).On the various geo-political uncertainties around the world and their impact on the global economic and social sphere, she said there have been many times in the past where there has been geopolitical uncertainty. “It’s been in different forms but it’s always been there. Big companies just learn to power through.” Nooyi said she has always said that “when you go into any country, you have got to act as though you are the citizen of that country. You can’t go in there and say everything is going to be done my way. Except the ethics and governance aspect, everything else is local.”As long as you go into a country and develop a local model and execute it locally, you live within the rules of that country. Don’t compromise your corporate governance principles. “You have got to be aware of politics, be sensitive to all the minefields, but don’t play in them, don’t take a voice in them because that is a losing proposition,” she said, adding that if companies have knowledge of what’s going on but they just focus on doing their business, they will be successful. Nooyi, answering a question on where does she see a balance between online retail and brick and mortar, said “if there is a shake out in retail, I won’t blame it on Amazon. That’s just retail getting efficient. Amazon is just improving the customer experience. Traditional retailer created a lot of friction in the system, and where there is friction, there is Amazon to take out the friction.” During the fireside interaction, Nooyi said growing up in India, she was surrounded by a tight-knit and multi-generational family and every member of the family stepped into parenting and disciplining the young children. Racing against time to meet the GST collection target for 2018-19, tax officers have been prodding businesses to pay taxes by Sunday so that the amount gets reflected in the GST revenue collection data for March to be released on April 1 (Monday), a government official said. Since taxes collected by non-EDI (electronic data exchange) ports takes about four-five days to get reflected in the system, the government is planning to come out with a reconciled data for full fiscal by April 10, the official further added. “The tax officers are putting to use their goodwill with the assessees and nudging them to pay the taxes by March end, the last month of the fiscal, to make up for the collection target for 2018-19,”‘ the official told PTI. The official said officers were also prodding some importers to front-load their integrated GST (IGST) payments in March for those inward shipments for which orders have already paid and are due to delivered in next couple of months. This practice of prodding assessees to pay taxes by March end to meet the fiscal target was also prevalent during the erstwhile excise and service tax regime. AMRG & Associates Partner Rajat Mohan said taxpayers in the erstwhile regime were hard-pressed at the close of the financial year to pay taxes over and above the actual tax liability. This was done to balance the revenue targets allocated to each individual division. GST would loose its lustre if tax officers continue to use methods of persuasive coercion, Mohan said. The Central Board of Indirect Taxes and Customs had directed its field formations to remain open during the last weekend of the current financial year, which is March 30 and March 31, 2019, for assisting the taxpayers in filing returns and paying taxes. The government had lowered the GST collection target for 2018-19 fiscal to Rs 11.47 lakh crore in the revised estimates, from Rs 13.71 lakh crore budgeted initially. GST collection stood at Rs 1.03 lakh crore in April, Rs 94,016 crore in May, Rs 95,610 crore in June, Rs 96,483 crore in July, Rs 93,960 crore in August, Rs 94,442 crore in September, Rs 1,00,710 crore in October, Rs 97,637 crore in November, Rs 94,725 crore in December 2018, Rs 1.02 lakh crore in January 2019 and Rs 97,247 crore in February 2019. For fiscal 2019-20, the GST collection target has been budgeted at Rs 13.71 lakh crore. BJP to bring fresh candidates in majority of seats if Congress AAP pact fructifies in Delhi ?